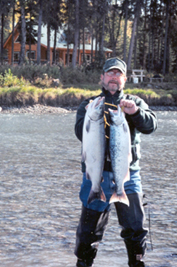 Kenai River Cabin Rentals for lodging and unguided shore fishing or guided fishing packages. Shop online for services and products found in Anchorage, Alaska and other Alaskan cities. Alaska Made gifts, real estate, outdoor gear, clothing, fine furs, restaurants, sporting goods, air taxis, building contractors plus weather and travel information links are also included. Additionally we have links to your favorite fishing and hunting guides, lodges and air services for those headed to the bush, as well as links to hotels in Anchorage and other areas of Alaska. links will provide useful information for not only Alaskans but also visitors to our great state. Alaskan vacation and adventure of a lifetime! is your guide for information on: fishing lodges & guides; hunting outfitters and guides; fishing / hunting seasons and run charts; bush air charters; guided and unguided vacation packages, cabin rentals and more. Copyright 2018, Alaska Internet Marketing, Inc. All rights reserved.